After being stripped off all its zest for cupcakes and crème brûlée, I was left with a ‘naked’ Buddha’s Hand. 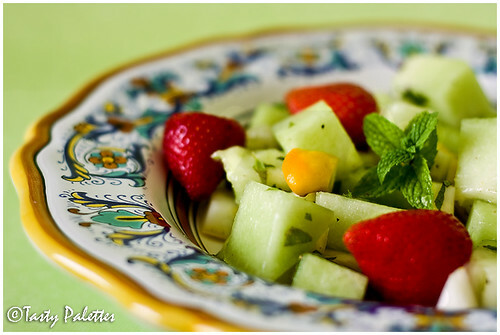 As light and refreshing it was, I made a simple summer salad by combining it with mint and melon. 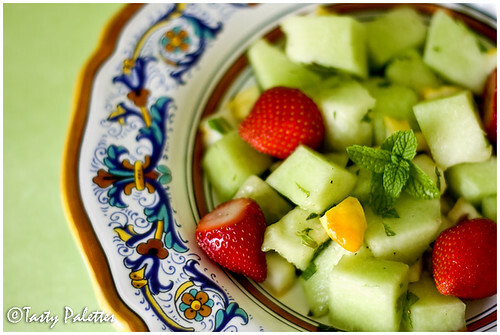 Its an ageless combination, but in this salad, the lemon pieces can be bitten into, rather than tasting faintly in the background. Talking about background and props, this melon salad is plated on a beautiful Italian earthenware, gifted by a beloved friend of mine. Gorgeous, exquisite and intricately crafted, it made my heart skip a beat when I opened the package. In an ocean of anonymity, such kinships are one of the things I cherish about blogging. My heartfelt thanks, dear friend. Mix all the ingredients and let sit for 15 minutes before serving. Serve at room temperature. When I searched the internet for recipes with Buddha’s Hand citron, there were not many, unfortunately. Some even recommended using it as a centerpiece in coffee tables, rather than cooking with it. I was happy that I could enjoy this amazing fruit in more than one dishes, and not as an eye candy. This final installment of 1-in-3 – Buddha’s Hand Citron goes to Michelle at The Accidental Scientist, who is hosting HOTM – Herbs. absolutely love the plate/dish - beautiful! A lovely cavalcade of color! So refreshing and vibrant. Your camera work does the salad and bowl justice. Lovely Salad Suganya..I love the plate. the salad looks delicious. Refreshing for the summer. Lovely color and a cool recipe for summer. I have`nt tried mint with the melon. Pic looks too tempting ... will try next time. Thanks for sharing your recipes with the Buddha`s hand. Salad looks very refreshing. Right in time for summer..
That salad looks nice and refreshing. I am going to have to look for the Buddha’s Hand. I have sauted Buddha's hand in olive oil in butter (cut into small pieces) and then when they're pretty much carmelized served that over seared sea scallops. It is absolutely delicious. I aslo mixed it with olive oil, lemon, sweet onion, garlic and Italian sausage over pasta. What a fabulous layer of flavors!